On Tuesday, the Dow plunged 567 points at the opening bell and briefly sank into correction territory before roaring back. On Monday, the Dow took its biggest single-day point plunge in history. Here's what you need to know about what's going on with the stock market. A correction is a 10% decline in stocks from a recent high. In this case, that was less than two weeks ago, when the Dow closed at a record high of 26,616. A correction is less severe than a bear market, when stocks decline 20% from their recent highs. The stock market's last correction began in the summer of 2015 and ended in February 2016. Last Friday's jobs report was strong: Wages are rising, and unemployment is historically low. That's great news for Main Street. But on Wall Street, it raises fears that inflation will finally pick up, and that the Federal Reserve will have to raise interest rates faster to fight it. 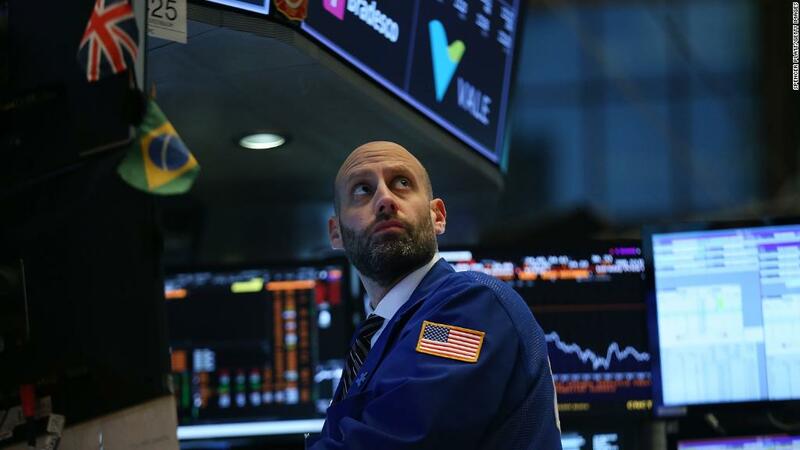 Overnight, world markets followed the United States' lead and dropped. The Nikkei in Japan closed down 4.7%, China's main stock index closed down 3.3%, and Australia's closed down 3.2%. European markets were lower, but not as much as Asia. Stocks were down about 2% in Britain, Germany and France. What does this mean for the Trump rally? From Election Day to the record high on January 26, the Dow climbed more than 8,000 points -- a remarkable 45%. Many factors were behind the rapid rise: The ever-improving economy and job market, business optimism, record corporate profits, and the big business tax cut, which Republicans made law. The losses in the market since the beginning of last week wiped out about a quarter of that gain. The Dow began Tuesday up about 6,000 points since the election. Monday's decline of 1,175 points on the Dow was, by far, the biggest point decline in history. The Dow had never lost more than 777 points in a single day. On Black Monday in 1987, the Dow dropped an incredible 22%. That's the equivalent of a 5,300-point decline today. And on several days during the financial crisis in 2008, the Dow dropped 6% or 7%. Monday's decline was 4.6%. That was the worst for the Dow since August 2011. I keep hearing the term "circuit breaker." What is that? After the stock market crash of 1987 and another big decline in 1989, the New York Stock Exchange put automatic limits on trading. The idea was to prevent panic selling. Think of it as an emergency brake. It takes a much bigger decline than Monday's to trigger a circuit breaker. If the S&P 500 declines 7% in any trading day, all trading on the New York Stock Exchange is halted for 15 minutes. This would be much more severe than what happened Monday. At its low for the day, during the scary period from 3 to 3:15 p.m., the S&P was down about 4.4%. After the 15-minute pause, trading resumes. If the S&P reaches a decline of 13%, trading is halted again for 15 minutes. These first two levels of circuit breaker apply only until 3:25 p.m. After that, trading isn't halted unless the S&P drops 20% -- market crash territory. If the S&P declines 20% at any point in the day, trading is called off for the day. Related: The Dow just lost 4.6%. What does that mean for you? Does all of this mean we're entering a recession?